It's that time of year again where I come to you asking for money. Here are some things you need to know about breast cancer: It's estimated that 1 in 9 Canadian women will develop breast cancer in her lifetime. That means 68 women TODAY are being told they have the disease. Cancer, and Breast Cancer, does not have prejudice. It doesn't pick and choose who it targets. Doesn't matter if you're young or old(er), married, single, divorced, white, black, tall or short. And I haven't met one person in my life who doesn't know someone who has been touched by it. This is my 6th year volunteering my time as Co-Run Director for the Woodbridge/Vaughan Run Site. Together, our Run Site, in 3 years, has raised more than $550,000 for breast cancer research. I think that's pretty outstanding. I'm also participating and fundraising as part of our Family and Friends Team -- now named Carmela and Nadia's Angels. This year, we have two honourees who will be proudly wearing pink shirts and no doubt, will be leading our pack. Please take a moment to donate to our cause. Your generosity and kindness is truly appreciated. Thank you for helping me be a Changemaker. 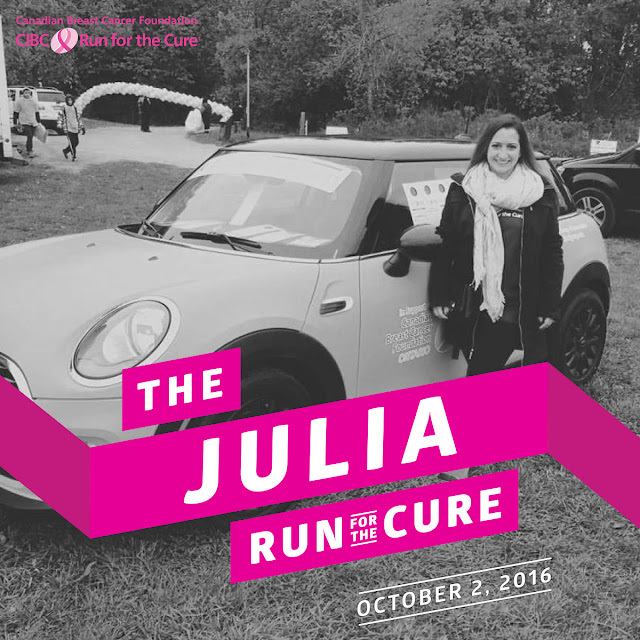 The Canadian Breast Cancer Foundation CIBC Run for the Cure is the largest single-day, volunteer-led event in Canada in support of the breast cancer cause. The money raised goes towards mission-related work including breast cancer research grants, fellowships, community health grants, health promotion, education and community/peer support programs. Since our inception in 1986, CBCF has invested over $360 million in breast cancer research; funding more than 1,400 scientific and community grants.